Us scientist have made a computer which can complete 2,00,000 trillion calculations per second. Making a power which has never been seen before in computers power and energy advanced materials and artificial intelligence (AI). Oak Ridge National Laboratory (ORNL) is a US department of energy anmed the computer summit. Summit is eight times more powerful than the previous high ranked computer called titan. It can calculate 3 billion billion calculation per second . 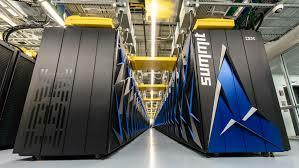 The specifications for summit system consists of 4,608 compute servers, each containing two 22-core IBM Power9 processors and six NVIDIA Tesla V100 graphics processing unit accelerators, interconnected with dual-rail Mellanox EDR 100 Gb/s InfiniBand. Summit can process 10 petabytes of memory paired with fast, high-bandwidth pathways for data movement. this combination of hybrid CPU GPU mark an amazing power in the history. For certain scientific applications, Summit will also be capable of more than three billion mixed precision calculations per second, or 3.3 exaops. “Summit will empower scientists to address a wide range of new challenges, accelerate discovery, spur innovation and above all, benefit the American people,” said Rick Perry, Secretary of Energy.